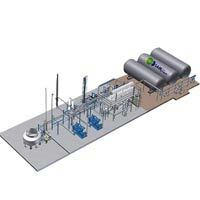 The CO2 Production Plants are based on combustion of various fossil fuels such as diesel oil, kerosene or natural gas. The plant can also be based on the flue gas of boiler, turbines, combustion engines, also from the natural sources, which contains appropriate amount of CO2 contents. 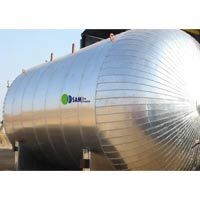 The CO2 production plants are supplied with the latest international technology and equipments and the CO2 gas produced meets the best international standards applicable for food grade quality or industrial use. 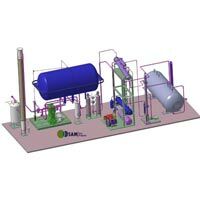 All the plants supplied mounted on skids for ease of installation and commissioning at site. The plants are controlled by a user friendly PLC based control panel and advanced automatic instruments which result into continuous and trouble free operation of the plant. Capacities ranging from 70 kg/hr to standard 150 kg/hr, 250 kg/hr, 285 kg/hr, 500 kg/hr, 1000 kg/hr, 1250 kg/hr & more can be provided. Options of multi fuel usage can also be provided. Our precision engineered range of CO2 Generation Plant is available in various capacities and models as per the clients specific requirements. These are designed as per client specifications and can store liquids and gases under high pressures. Our precision engineered range of CO2 Recovery Plant is available in various capacities and models as per the clients specific requirements. These are designed as per client specifications and can store liquids and gases under high pressures.